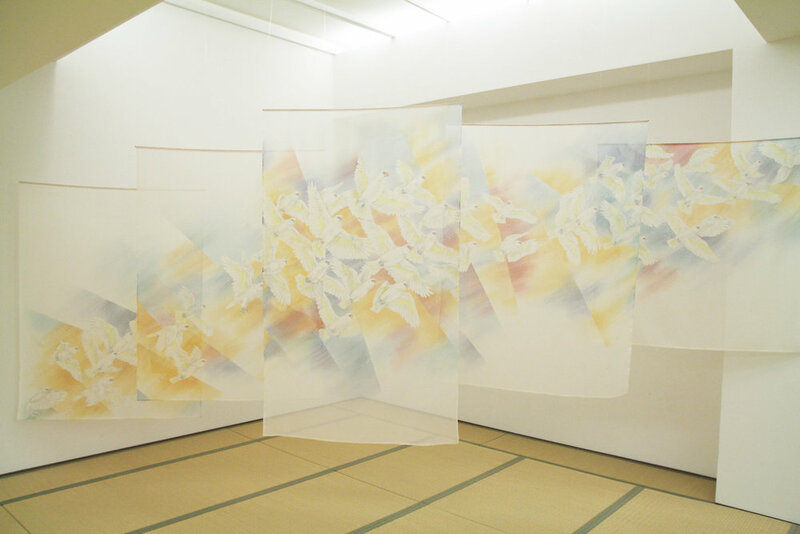 These are various installation-style works I have dyed. They are often semi-transparent. I like to create a sense of space and movement. These are a way to use traditional Japanese textile dyeing techniques in a contemporary application. Solo Exhibition at the Japan Foundation, Sydney, 2016. Pictured are "Canberra Blues" 2014 and "Murmurations" 2014. Photo by Document Photography. "Shatter the Immense Summer Sky" detail. "Along the Murumbidgee" 2017. Photo from "Naturescapes" Solo exhibition, November 2017, ANCA Gallery, Canberra.